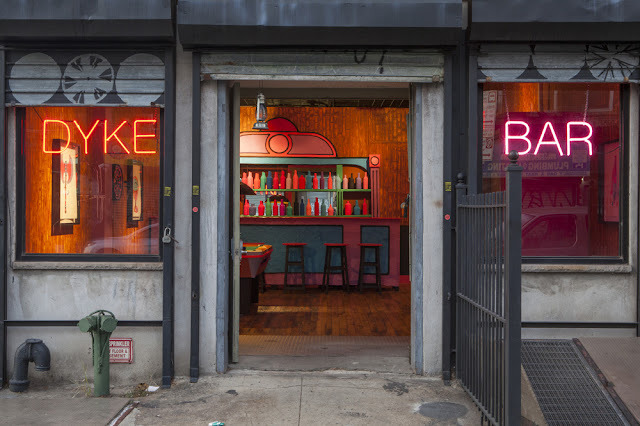 VISIONS : BAR DYKES: now available online! 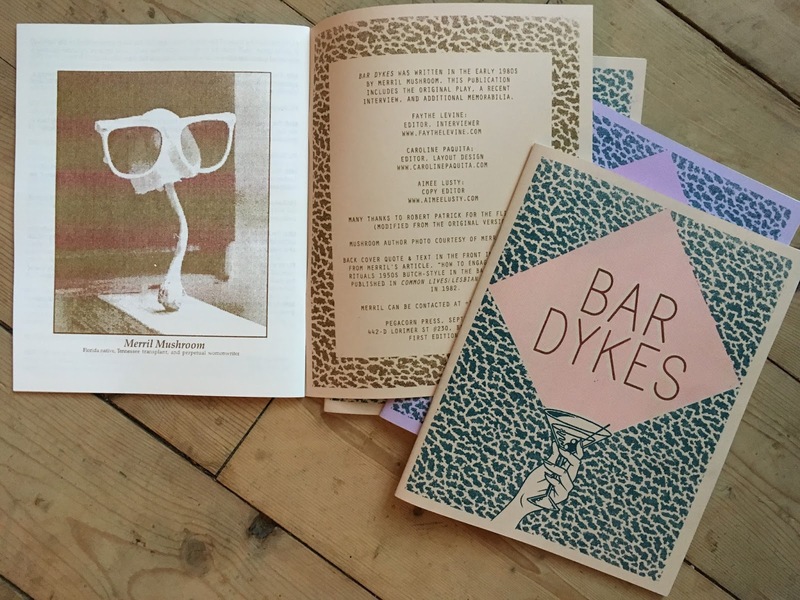 BAR DYKES: now available online! The short version, my latest project Bar Dykes is now available online via Pegacorn Press. The longer version begins with a chain of events starting with a nearly 20 year friendship with Caroline Paquita of Pegacorn Press. Caroline and I have an intertwined history rooted in underground DIY culture. I met Merril Mushroom, author of the play Bar Dykes, this past year when I moved to rural middle Tennessee. Merril and I started spending a lot of time together and one day over coffee we were discussing Eulogy for a Dyke Bar, an immersive installation by Macon Reed. Macon is another close friend and wonderfully talented artist femme in my life. The Eulogy piece was an incredible happening which used her own artwork as a backdrop for a line-up of performances, DJ's and programing. I was able to experience the impact of this project first-hand during the second rendition of the installation at Pulse Art Fair last year. The conversation about Macon's project triggered Merril to tell me about a number of her unpublished writings including the play Bar Dykes, a period piece about dyke bar culture in the 50s she wrote in the early 80s. I recognized the significant importance of the play and also how Merril’s personal story is intimately connected to the work and had the idea to republish the piece with an accompanying interview. I made the connection to Pegacorn Press after seeing one of Caroline’s infamous calendars hanging in Merril’s house and realized they were already friends and fans of one another’s work. When I reached out to Caroline about publishing Bar Dykes along with an interview with Merril, she was instantly on board. A wonderful example of synchronicity and community coming together to make an important piece of history available to a larger audience. I just celebrated my year anniversary of making the leap to live in rural community. I was drawn to this area of Tennessee because of the 35+ year history of radical queer’s who have made this area home in various forms of intentional communities, land projects, communes, and houses. I came here, like many others, for a combination of reasons; to heal, to slow down and to have space to breath. My experience “out here” has been life altering. Meeting Merril is a large part of that because I’ve never had the opportunity to share space with an queer elder who’s inspired me so deeply. This publication is an affirmation that I am exactly where I am supposed to be. It’s a personal reminder that the world is small and our actions resonate outward. A theme that has resonated throughout my career as a curator, author and filmmaker is connecting people and generating community through access to information. I want my actions to inspire, educate and empower those around me. My hopes are this zine is a now a part of this lineage.